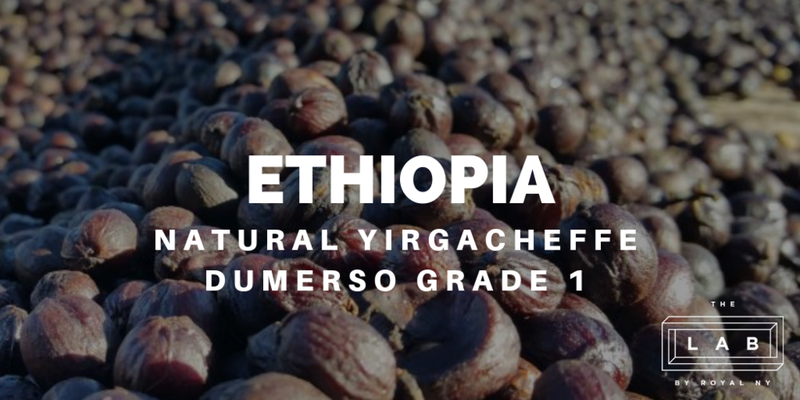 This lot comes to us from family-owned farms around the Dumerso washing station, which is located in Dumerso, Ethiopia. The town isn’t far from Yirga Chefe, and is part of the Gedeo Zone of southern Ethiopia. Surafel Birhanu and his family own the Dumerso mill, where they process the coffee of more than 750 smallholder coffee farmers. During the busy harvest season, Surafel employs an additional 400 people to help manage the influx of coffee. Delivered coffee cherries are sorted and dried on raised beds in thin layers and are turned constantly to prevent unexpected over fermentation. Coffee is then de-hulled and sent to Addis Ababa for final milling and preparation for export. The physical specs of this green coffee match what you'd expect from a higher-end Ethiopian delivery. Density is above average at 0.67 g/mL, and water activity is right around normal. Moisture content is a little on the higher side, but not out of the realm of the ordinary. Screen size is on the smaller side, with more than 80% falling between screen sizes 14 and 16. This is a natural-processed coffee, meaning the bean is dried in its own cherry after harvesting. After drying, the bean is pulped and hulled, removing the pulp and parchment and leaving you with the final green coffee. This particular lot is a lighter green color; a trait common to natural-processed coffees from the region. Processing like this tends to lead to a more fruit-forward cup, so keep that in mind as you develop your roast profile. As mentioned previously, there are a few things to keep in mind for this roast profile. Since the moisture content is a little on the higher side, we'll want to drag out the drying time a little bit, but will also need to start with a higher drum temperature to compensate for the slightly higher density. From there, we'll keep the browning phase a little on the long side to caramelize the sugars present in the coffee and give it a reasonable development time after first crack to see how much fruit we can pull out without losing any of the acidity. The Lab recently partnered with Stronghold Technologies, a roaster manufacturer out of Seoul, South Korea. We'll be using their Stronghold S7 Pro for this coffee analysis; keep an eye on this blog for further profiles and notes as we continue to use this new roaster. Stronghold Technologies will be roasting this coffee at their booth at the New York City Coffee Festival on October 12th-October 14th. Be sure to check it out! Our profile notes are below. Note the difference in charge weight and the temperatures each roast achieved in their respective roaster. This is definitely something we're going to look into more as we continue to experiment with the Stronghold and the IKAWA. We were excited to brew this coffee since our arrival sample notes were excellent. The original roasted sample from our Probat machines gave us a floral cup with notes of raspberry and blueberry, and we wanted to see how these roasts stacked up to that original sample. The Stronghold sample came out bright, tart, and a sweet, with a higher acidity than our original sample roast. While not unpleasant, it definitely brought a different profile to the cup, with notes of chocolate, cherry, strawberry, and a tart orange note. The IKAWA sample was a little sweeter, with a creamy body and notes of cocoa, strawberry, and blueberry. The coffee used for this analysis is reference number 40322 in New Jersey. This is a limited-availability lot, so be sure to get some while you can! Stronghold Technology will be roasting this coffee at their booth this weekend at the New York City Coffee Festival. Stop by their booth for a roasted sample and some more information! The Shwe Padauk lot comes to us from both the Ywangan and Pyin Oo Lwin regions of Myanmar, both of which are at the forefront of the country's increased specialty coffee production. These regions are about 100 kilometers away from each other, and have different approaches to production. In Pyin Oo Lwin, coffee is produced on larger private estates, usually between 200 and 400 acres in size. Ywangan is dominated by much smaller farms, which average around only 2 acres. Though both regions are over 1,200 meters above sea level, Ywangan is a little higher than Pyin Oo Lwin and is slightly harder to access due to much more mountainous terrain. This coffee gets its name from the padauk flower found in the regions of Pyin Oo Lwin and Ywangan. Locals consider this flower a symbol of the beginning of a new season, with the first blossoms of the padauk usually coming around the start of the rainy season. This is also the beginning of the coffee export season, and the new year celebration called Thingyan. This lot is made up of the same varietals as the Shan State Ywangan lot profiled here. Back in the late 1980's Myanmar's government imported several tons of coffee seeds from other coffee-producing countries, with a particular emphasis on high-quality, yet robust plants. The Shwe Padauk lot is made up of SL28 from Kenya, and the Costa Rica and Catuai varietals from Costa Rica. These three varietals gave the farmers of Pyin Oo Lwin and Ywangan flexibility in their offerings and a diverse set of trees to grow. This coffee's stats line up well with other specialty sizes. Screen size and green coffee appearance are both quite normal, with good preparation and few (if any) defects. Density is a little on the higher end, so be sure to adjust your roast profile as necessary to compensate. We decided to roast this coffee along side the other Myanmar lot we received and started out with a basic washed profile that we've used before. That provided a starting point for the roast, but didn't exactly hit the cupping profile we were looking for. We went back to the drawing board, and put this coffee through two new profiles. The first attempt tried to develop the heavier, sweeter notes of the coffee by extending the overall development time to almost a third of the overall roast. This worked out fairly well, and we were rewarded with a smooth, sweet cup (notes on that below). The second roast of the coffee was shorter overall, but had a longer post-crack development time. The development-to-time ratio (DTR) of this roast was higher than the first, but ended up muting some of the sweeter fruit notes in the final cup. We brewed this coffee twice; once through a Chemex and once as a single-origin espresso. The Chemex gave us a smooth, sweet cup, with notes of butterscotch, red apple, toasted marshmallow, and graham cracker. The espresso here gave us a heavier, sweeter shot with notes of butterscotch, orange rind, and honey. For those familiar with brewing espresso, you'll notice our yield of 27 grams demonstrates more of a "ristretto" or concentrated shot. This higher concentration worked well, probably in part to the coffee's very structured and prominent sweetness. Feel free to play around with the recipe if you're using this coffee as a single origin espresso; it has a lot to offer and encourages some exploration! The coffee used in this analysis is reference number 38342, and is available for shipment out of our New Jersey warehouse. Lot number 39883 and 39878 will be available in Wisconsin and Jacksonville shortly. Long troubled by conflict, the Democratic Republic of the Congo (DRC) is a relatively small specialty coffee growing origin compared to its larger-volume neighbors Ethiopia or Uganda. The Republic of the Congo initially achieved independence from Belgium in 1960 but was plunged into civil war shortly thereafter in the Congo Crisis from 1960 to 1961. Another coup in 1971 saw the name of the country shift to Zaire, then back to the DRC after 1997 following the disastrous First Congo War and related Rwandan genocide. The Second Congo War lasted from 1998 to 2003, devastating the country and, by extension, the coffee trade. The DRC is no stranger to coffee production. Back in the late 1980’s, exports peaked at 119,320 tons, but declined sharply in the following decade due to the civil wars in 1997 and 1998. After a peace agreement was signed in 2003, production was at 212,000 bags, up from 179,000 bags in 2002. Currently, the DRC produces approximately 335,000 bags of coffee per year, exporting about half of that in 2016. It remains a relatively small producer for the continent, though the export numbers have been rising steadily in the recent past. The DRC is the second-largest country in Africa by land area (and the largest in sub-Saharan Africa). The area around Lake Kivu, one of Africa’s Great Lakes, provides a remarkably good terroir for coffee production. The high altitude relative to the lower-lying areas to the north allows for thousands of smallholder farmers to produce coffees like this one, which is processed in the Butembo village on the western shores of Lake Kivu. The coop that we source this coffee from, Soprocopiv, specializes in organic specialty coffee production, and have continued to improve not only their coffee processing methods, but also local healthcare and educational services. The Kivu Butembo lot is a bourbon varietal. Originally from Yemen, bourbon traveled to the island now known as La Réunion in the early 1700’s, and only left the islands in the mid-1800’s as French missionaries traveled abroad (making its way to the Americas in the 1860’s). From there, bourbon (and its derivatives) have become one of the most common coffee varieties produced today. Bourbon is a taller than average plant that produces an average bean size and medium yield. The trees are productive at first around their fourth year and tend to ripen fairly early. Bourbon is unfortunately susceptible to issues such as coffee berry disease or coffee leaf rust. This lot is grown at over 1,500 meters above sea level, comfortably within the optimal growing range of the varietal. Freely-settled bean density comes in at 0.70 g/mL, which is slightly above average. This density measurement lines up well with other African offerings, which tend to be above average, often measuring between 0.69 g/mL and 0.72 g/mL. When roasting, this higher density can cause the coffee’s development to slow down a bit before first crack; you can compensate for this by charging with a hotter drum over a lower flame setting to evenly develop the bean. After harvest, coffees go through a de-pulping and washing process and are sun dried on patios. The coffee arrived to Royal NY with a moisture content of 10.8%, which is well within the acceptable range for such a coffee. We did two roasts of this coffee on our IKAWA Pro sample roaster. We like the IKAWA because of its ability to export precise roasting data on limited sample sizes; we only needed 50g of coffee for each roast. If you’ve got an IKAWA of your own, feel free to download the profiles (click on the graphs) to try on your own! The first IKAWA roast was designed to bring a lengthened browning stage and post-crack development to the coffee. Since the moisture content was right around average, we left this to a normal-length drying phase with a slightly higher charge temperature. We set up the second roast to drag out the development time a little longer in an effort to boost the body of the coffee. The browning and drying stages were just about the same as the first roast. We brewed both of our roasts using a Hario V60 pour over. Each pour over was done at a 1:13 ratio, with 30g of coffee. Both coffees had a brew time of 3:04 using a grind of 6 on our Mahlkonig EK43. Our first roast was defined by a pleasant, citrusy acidity and a sweet, smooth body. We found notes of candied orange in the acidic front of the coffee, with sweeter notes of cola, brown sugar, and plum in the body. The second roast was (as expected from the longer development time), a little heavier in the body, with more caramel and butterscotch notes for sweetness. The coffee used in this analysis is reference number 37575 out of our warehouse in New Jersey. Coffee from the DRC is, as you’ve read, in short supply generally, so please be aware of that if you’d like to place an order. Harvest generally takes place from August to December, with exporting happening from January through April.